We believe in freedom, we believe it is possible to give the world inspiration, positivism and international skills to move a step forward in society. We believe that together we are stronger. We believe we can protect the conditions of bringing people together. We are perseverant and we trust it is possible. Our Vision is to Democratise Diplomacy by Innovating in the rules and procedures. We do that by sharing the knowledge, creating bridges and enhancing Private, Public and Civil Society Partnerships that allow individuals, entities, enterprises, governments, corporations and foundations to collaborate and jointly share their know-how, competences and cultures. We are 3 elements: part Community Network, cut Innovators, and side thinkers. We offer our members a unique body of collaboration, support and resources opportunities to form unique cooperations. Joining our worldwide community of members you join a Global Network in 96 countries that will bridge, Inspire and facilitate you to develop your finest work towards your purpose. 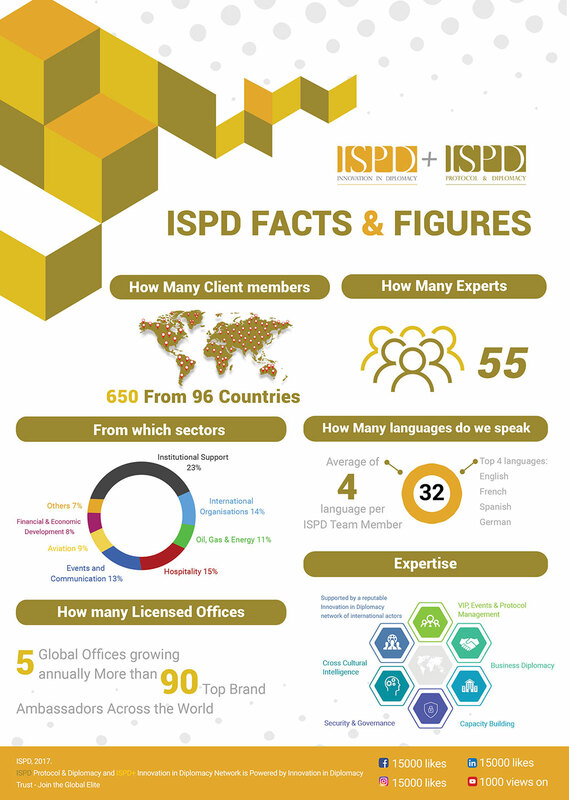 The ISPD+ Innovation in Diplomacy is the first and only non-profit Corporate Diplomacy, Governmental Affairs, Global Responsibility Cross Cultural Intelligence, Soft Diplomacy and International Protocol community worldwide. Our Global world is being recreated everyday. What began as a vision in one basement of Brussels in 2008 has evolved into a global network of bringing people together towards one single vision: Global Responsibility. Come to any of our concepts around the world and experience a unique combination of education, innovation and people that share experience, stories and empower diverse individuals that would never dreamed on possibility. Innovation of relationships is an essential concept in a world that is in a process of constant change. Although we are so different worldwide, common solutions must be found as soon as challenges arise. Those solutions require creativity, flexibility, and adaptability. Here Creators, Innovators and visionaries from around the world come together on a Global responsibility to democratise diplomacy, experience and possibility. Innovation in an evolving world further entails intelligence to continuously bringing us together because we understand that cultural Differences are richness. We are committed to listen, evaluate and improve performance to allow progress and we never compromise on quality. Our Values are the essence of everything we create. 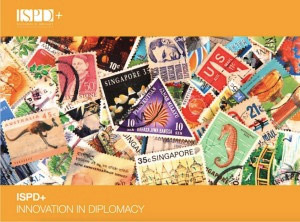 The ISPD+ Innovation in Diplomacy is the first professional non profit organisation in the world whose mission is to recognise, connect, and advance International Protocol, Corporate Diplomacy and Global Affairs professionals towards Innovation. Our community is comprised of companies across industries and sectors, 500 Fortune Companies, Embassies, Diplomatic Academies, Philanthropists, Chiefs of Protocol, Diplomatic corps, experts and representatives of different organisations that are shaping the world. Our Social Economy requests and urges for different types of Innovators that can marry the profit and non profit. The discussions on business practices and business ethics between stakeholders shareholders and now the “stackholder”. The socially conscious businesses and business models cannot be blind to skills that are shaping relations: Soft Diplomacy Skills. We need that Innovation across industries, sectors and Public Private Partnerships. We advocate Innovation in Diplomacy. We currently went global, we reach 96 countries with 7.000 contacts, 600 participants in our network and an outstanding board of experts. Become part of our network by joining the global elite today! Brussels is the Capital of Diplomacy of Europe and our headquarter. From Bilateral Diplomacy to Multilateral Diplomacy passing in depth in Corporate Diplomacy and Soft Diplomacy. Negotiations are Brussels keyword. We are first Global Association and Network in the world that has the Mission of Innovating in Diplomacy and bringing the stakeholders triangle partnerships closer than ever: Public, and Civil Society Partnerships together across borders. Innovation in Diplomacy Network is the leading non-profit network in Brussels for corporate, association, institution or private protocol, global affairs and events organisers that are innovating in diplomacy. Over 6,000 summits, official events and conferences are organised every year and more than one million visitors come to contribute to development of the world. This Network is for you and your organisation. – Why did you decide to create this non-profit project? I realised that it would be great if people could share their own experiences and best practices of their professions, and a network of like-minded people is the best way to do so. In our jobs everything is unique and there are no second chances. Therefore, in order not to miss our first and only opportunity, we should be able to share our experiences and to learn from others. – What makes it different form other networks? Our network is to link individualism to collectivism, private to public, social economy to profit, development to advancement, community to learning where the all globe should part of. We are unique and almost paradoxal, as we want to innovate in tradition maintaining identities and values of what make us society. We have the mission to preserve the ethics behind the skills and share those skills that one day were closed to one elite. Our Network is courageous to question Status Quo and to Innovate where the stone is many times hard and static. From the point of view of an outsider, each official event, relationships, business development areas, governmental management or global affairs seems to be the same or unreachable and but everyone has a different approach and solution. Standards must be based on excellence. In the world of today we cannot afford to loose valuable insights from all excellence sources. On one side Innovation and Cultural Democratisation, On the other Corporate Diplomacy and Protocol. This is an interesting combination and a path to excel from good to exceptional. The world is in a process of constant change. So we cannot adapt properly if we do not innovate. Problems arise and the solutions have to be found instantaneously. Of course, we can plan, but a lot of unexpected things can happen. At those moments, in order to find a solution and adapt, we need creative minds that innovate and use skills that were in the blind spot before. – We live in a global, very diverse, multi-cultural world. How can we successfully communicate with each other? By understanding others and by accepting the differences. To set us relationships management properly. How can we still being speaking about VIP, stakeholders and shareholders without Protocol and Public Affairs without Corporate Diplomacy, Business Development without Concept Design. It is something Intriguing to me as the bridges of the standards are there and few see them still. – How could we overcome obstacles? Is it by changing our mindset and/or by acquiring new skills? By acquiring new skills and by our readiness to adapt when necessary. Our solution to a problem or conflict has to be immediate and accurate nowadays. The skills and the network are our help in finding the suitable solution. We do not live anymore in an island (even if some of us want that) we need each other, our differences and our complementarity to advance. As many stories and experiences we can share with others, the more ready we are to adapt and manage the difficult situations. I honestly believe that the uniqueness of this network underlines our individualities. We are free to be ourselves, to say what we think and to combine the knowledge the way thrives us to success. We ask questions. We ask you to become our members, donor or partner. We ask our Global Network to participate in our ideas box, evaluation of actions, to give their testimonies and to respond to International Quality Auditing. From a global sample of 600 people in 96 countries, our most recent quality audit QFOR (for education) with a methodology called client scan grabbed the time of our community with lists of questions and inquiries from defining who is each individual of our community, what their are doing globally and as well the part that The ISPD+ has played in supporting their journey from intension to impact. Our commitment to listen, evaluate and improve performance it is our first step in honouring our values. The following step is progress. We define progress as our methodology he results of our annual survey inform our strategic plans, help us identify and advance best practices, and support the further development of a coherent theory of change.